Word cloud created with Tagxedo. Over the summer, Becky, one of my social studies teachers, tagged my co-librarian, Elaine, and me in a Facebook post. Becky was asking for ideas on how to promote civil conversations in her Contemporary Issues class, a course she is teaching for the first time this semester. I was thrilled that Becky wants to focus on civil discourse in this class. Our current political situation is so contentious that some teachers try to avoid controversial topics entirely. While that’s understandable in some ways, it doesn’t help solve the problem. 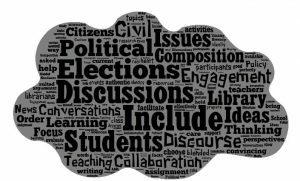 With so many examples of false statements, backbiting, and character assassination disguised as political discussion on social media, students need someone to teach them how to have respectful conversations about politics and public policy. I was also delighted that Becky asked her librarians for ideas and resources. 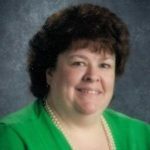 School librarians are ideally suited to help teachers (and students) prepare for and hold civil political discussions. After all, real civil discourse requires participants to be knowledgeable about the topic under discussion. They must do research to find facts that support their arguments. They must be able to effectively evaluate information in order to weed out “fake news,” identify bias, and find the best sources available to them. In other words, they need good information literacy skills. Civil political discussions also require participants to consider and respect different points of view. This ties in perfectly with the AASL Shared Foundation of “Include,” which requires students to “demonstrate an understanding and commitment to inclusiveness and respect for diversity in the learning community” (AASL National School Library Standards for Learners, School Librarians, and School Libraries, p. 76). 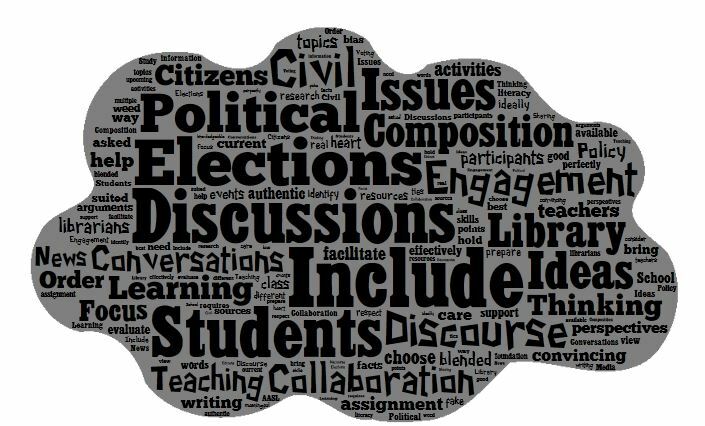 Helping teachers facilitate meaningful class discussions about the upcoming election and other current events topics is an authentic way to bring the “Include” foundation to students. Talking across Divides: 10 Ways to Encourage Civil Classroom Conversation on Difficult Issues. From The New York Times Learning Network, this lesson plan provides practical suggestions (such as establishing expectations and structures conducive to civil conversations) and provides links to articles about America’s political polarization that students can read and discuss as they embark on the path to respectful discussions. Civil Discourse in the Classroom. This resource is from Teaching Tolerance, an organization committed to providing resources and support for teachers committed to celebrating diversity and promoting social justice. It contains ideas for creating a discussion-friendly environment in your classroom (or library), suggestions for teaching current events, and ideas for helping students build reasoned arguments supported by evidence. Relationships First. Sponsored by All Sides for Schools (a 2018 AASL Best Website for Teaching and Learning) and Living Room Conversations, Relationships First is a nonprofit that offers two free lessons designed to provide “students both an intellectual and experiential understanding of the value of listening, respect and holding the tension of our differences.” The lessons require students to participate in structured conversations while focusing on maintaining positive relationships. During the first week of school, Becky asked her class to brainstorm a list of rules for discussions. Once the list was complete, she led the class through a comparison of their list with the suggestions from Relationships First and Living Room Conversations, which confirmed her students were on the right track. Students then practiced following those rules in practice discussions on less-contentious topics such as cats vs. dogs and peanut butter vs. jelly. Becky’s class is currently looking at life in the Information Age, specifically the pros and cons of social media. The class recently visited the library so that Elaine and I could teach the students to use Piktochart. Each student created an argumentative infograph that answered the question “Is social media good for us?” (Surprisingly, a number of students argued it is not.) Elaine and I hope to work with the class on at least one more project before the semester ends. My conversations with Becky about utilizing these resources got me thinking about the the students at my school, especially the juniors and seniors. Because Contemporary Issues is an elective course, not all students take it. Yet, some of these upperclassmen will be eligible to vote in the upcoming midterm elections and almost all of them will be able to vote in the 2020 presidential election. I want them to be civically engaged, well-informed voters. Yet, I know from looking at voting data that young voters cast their ballots at a lower rate than older voters. I started wondering how Elaine and I could collaborate with other teachers to create learning experiences that will encourage these students to exercise their civic responsibility of voting. I remembered a conversation I had last spring with Greg, a language arts teacher, about designing a “blended writing” (combining narrative and informational/persuasive writing) assignment for his Senior Composition class. I came up with the idea of having each student choose an issue that matters to him/her, research how that issue affects young Americans, and convince their peers that they should care about the issue, too. By requiring students to include a personal story (their own or that of someone they know) as well as general background information, they will be able to illustrate why the issue is important to people their age. I met with Greg and Elaine over the summer and shared my idea. They liked it, and we decided to incorporate the idea into a PBL-style research project. Students will write a paper and create a short video presentation to share their classmates and, hopefully, other classes. We plan to build in several “community building” activities to allow students to share their ideas and practice listening to the ideas of others in order to give constructive feedback. While these lessons and projects won’t solve our nation’s political divide, maybe they will show my students how to disagree without being disagreeable. How are you incorporating the “Include” foundation into your lessons and practice? ‹ If You Manage Them, They Will Learn…. Sharing with my social studies department head right now! Great post. Thanks!